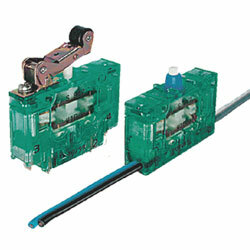 The S847 switch is available in three standards of ingress protection. IP40, IP60 (dustproof), IP67 (waterproof to 1 meter). The forced contact mechanism ensures positive opening, even if an overload has caused the contacts to stick. This also applies in cases where the switch is subject to spring failure. Another leading feature of this snap action switch is the fast change-over time that is totally independent of the actuation speed. The permanent load capacity is 10 Amps but the wiping action of the self-cleaning contacts also allows the switching of extremely low currents.